They came from Mexico, Ireland, the Basque Country, and many other countries throughout the world. Many left their home countries to escape poverty or political persecution. Others were looking for opportunities in the “land of the free.” Once here, they settled in places like New York, Chicago, and even in Kern County. Immigration and Naturalization in the United States has a varied history. 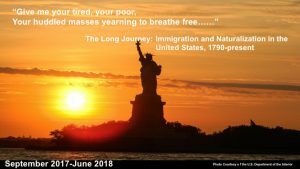 Some argue the country was founded by those escaping tyranny in the “old world.” But not long after its establishment in 1789, many Americans began to examine the impact immigrants were having on the country. Beginning in 1790 with the Naturalization Act, over the years, the United States enacted, repealed, and modified a large number of laws in order to control the effects of immigration on the country. This exhibit tells that story and some of the stories of immigrants who helped build Kern County.